Mister Kool II produces fog that stays low to the ground, similar to a dry ice effect -- but using just standard fog juice and ice cubes. No need for expensive fog chillers, bulky air conditioning units or dry ice! Includes a timer remote with an on/off switch. F-5 is the new evolution of the very popular of F-3 with four major improvements; 1.The haze output is 200% higher than the original F-3 with enhanced and smoother haze flow. 2. Larger heater tubing further reduces the risk of heater clogging. 3. Even quieter than the original F-3. Perfect for venues where quite operation is a must. 4. Multi-languages control interface available. More operation-friendly for users in different areas. This machine produces low-lying smoke without the inconvenience of dry ice. Place up to 22 lbs. of ice into the ice chamber to cool the smoke produced by the 1000W smoke machine contined in the unit and watch the floor disappear. A full ice chamber can last up to 12 hours or 80 minutes with constant use. Full DMX control. The M-Series Stage Foggers are uniquely designed to meet the rigorous demands of stage and tour use. Antari's new revolutionary fog machines feature integrated wireless control intelligence. This premium-performance series is specially upgraded for professional users who demand true plug-and-play operation for stage fog machines. All the unnecessary wires are eliminated, leaving you a transmitting controller in your hand to send out the commands. Enjoy complete wireless control without hassles! 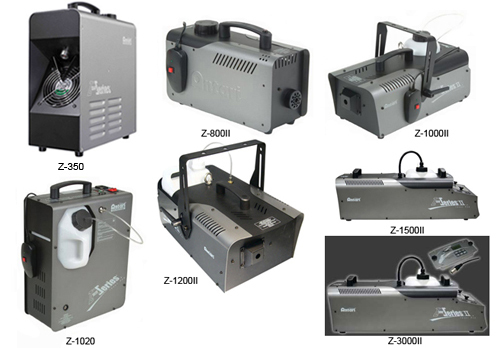 These fog machine provide significant advantages in a wide array of applications where volume of fog output is critical. 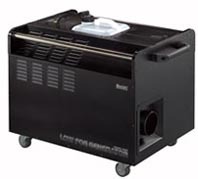 1000w continuous output fast warm up fogger. 800w Fogger wigh built in WIFI control from any iphone, ipad or android device free control ap on ap store. The M-1 Fogger is perfect for photographers to use on location and is great for theatrical and cinematic applications. The M-1 is ideal for situations where a touch of fog is required. Because of its dimensions and weight (about 2 kg), the M-1 can be discreetly placed on props, inside sets, or held on hand. 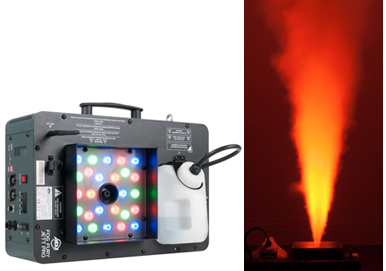 The Dry Icer is a new and improved professional, cost-effective solution for creating spectacular low-lying fog effects. This sleek new design has a 20-pound dry ice capacity which is placed in a stainless steel basket. Other new features are low water shut off indicator, 4” hHose adaptor and heavy duty latches on the lid. The low-lying fog output is controlled by lowering the stainless steel basket with the 3-step Pivoting Ratchet System. This will allow the basket to ease into the boiling water to create continuous low-lying fog for approximately 5 minutes. Perfect for smaller venues and mobile entertainers, Nimbus™ Jr. is a compact version of the original Nimbus™ dry ice machine. Simply fill it with just over two gallons of water, add up to 5lbs (2.3kg) of dry ice, and plug it into any standard wall outlet.